my world of wool: more crochet owls and Moby - Why Does My Heart Feel So Bad? 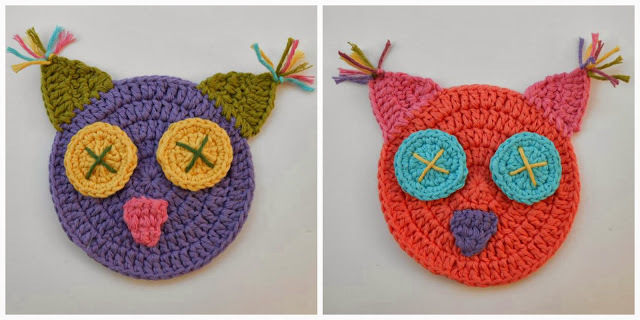 more crochet owls and Moby - Why Does My Heart Feel So Bad? because maybe the species is recovering a bit ... I wish! they are two crochet owls! yeeeeeeeeees!!! with Drops Paris and 3mm crochet hook. I think they are the same species ... two owls of my world of wool! these two owls very soon will travel to home of Ona and Ada! I hope you liked these owls, Anna! leave a window open so they can enter to your home! but I think everyone knows that, right? Che belle allegre applicazioni ! Oooh quina monada!! m'encanten els colors... què finet cristina. A l'Anna li encantaran els mussols són molt bonics. Están lindos los buhos, Cristina. Son tan divertidos y coloridos. Ui, quants de dies sense deixar-te comentaris!!! Aquests dies vaig una mica de bòlit i des del mòbil m'és molt difícil deixar comentaris!! Són uns mússol moníssims, trobo que per aplicacions quedaran genials!